Training on a bicycle is the best way to improve speed and endurance while staying in shape. Unfortunately, it’s not always possible to get outside and hit the road. If that’s the case, there are other ways to get your cycling fix. While fixed exercise bikes are available at most gyms, they’re not designed to provide a faithful biking experience. That’s when an indoor bike trainer comes in handy. 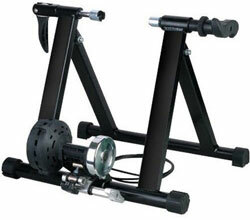 Indoor bike trainers provide you with the most realistic cycling experience. Unlike exercise bikes that have a basic configuration, indoor trainers allow you to cycle on something you’ve already established. 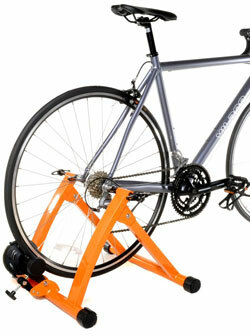 You place the rear wheel of your existing bike into the trainer and pedal away. The bike stays stationary, but the trainer provides varying degrees of resistance. It also makes it possible to us the gears and brake system on your bike, making it ideal for competitive training. There are many bike trainers out there, all using different technologies to provide resistance. If you’ve never used one before, you need to carefully consider which option is better for your bike and needs. Here are 7 of the best indoor bike trainers available. This trainer from Gavin uses magnets to provide resistance. It has a single adjustment that gets more difficult the faster you ride. It’s compatible with 26 and 27-inch bikes. It also works well with 700c models. The bright orange frame is quite wide, resulting in better stability. There’s also mounting cups to add further strength. They can be loosened with the included quick release. The entire unit folds up for easy storage. Gavin even throws in a riser block for the front wheel, allowing you to get started with your training immediately. Compatible with 700c bikes and those measuring 26 inches up to 28 inches, this magnetic trainer offers quick resistance adjustment. It has 7 levels of resistance and a controller that mounts on the handlebars of the bike for quick adjustment. 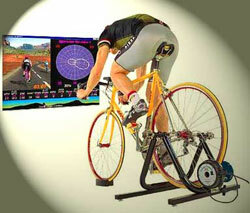 To add further resistance, the trainer uses the bike’s gear set. For stability, the trainer has a wide “A” frame and a skewer that keeps the back wheel steady at all times. A locking lever secures the axle. It too folds down for storage. 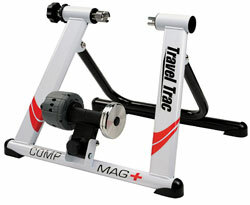 From Travel Trac comes this easy-to-use magnetic trainer. The large base provides excellent stability and the entire unit folds down to a compact size. 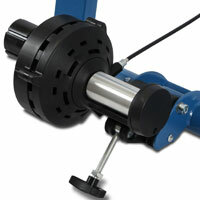 The flywheel containing the magnets allows you to pedal smoothly despite the level of resistance. The opposing magnets repel each other to provide 3 different levels of resistance. It does so quietly and smoothly, decreasing the level of vibration. Unlike other options with limited compatibility, this trainer fits most mountain and road bike sizes. Made from hefty steel, there’s no worry about buckling or damage with this trainer. It’s fairly easy to set up with both mountain and road bikes that have a 26 or 27-inch wheel. To get the best fit possible, the trainer has a knob that makes tiny adjustments. It’s a magnetic resistance trainer that has 5 different settings. Each setting is progressive to create a challenging ride regardless of the settings. *A handlebar controller allows you to make quick adjustments on the fly without having to get off. 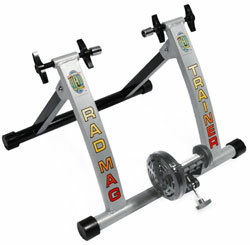 Designed for portability and strength, this magnetic trainer from RAD Cycle Products has a tough frame design made from durable steel. Even with the solid materials, the unit is relatively light and collapses on itself for transport. 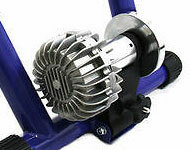 Compatible with most standard bikes, the trainer utilizes magnets for resistance. They provide opposition right away and progressively increases in intensity based on your speed. The flywheel is small, out of the way, and covered in durable plastic to keep the magnets protected. This ensures a long-lasting product. While it may look simple in design, this trainer has a number of safety and performance features to enhance your cycling session. The frame is durable and designed for stability. The feet are leveling, allowing you to keep the entire unit and bike steady regardless of how fast you’re pedaling. The magnetic flywheel provides 5 different levels of resistant. It’s connected to a roller made of PVC. The PVC is wrapped around a steel drum and improves traction on the rubber wheels of the bike to improve efficiency. 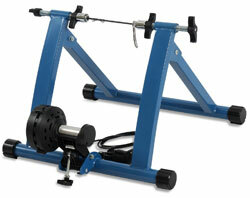 Using fluid to provide resistance, the T-2700 trainer from Kinetic provides a realistic ride. With varying levels of resistance, the trainer creates an authentic cycling experience. It’s a smart trainer that has a built-in sensor. This sensor connects to a smartphone to track your performance. It tracks speed, power, cadence, and heart rate. There’s also built-in workouts if you’re up for the challenge. The frame is made from powder-coated steel for looks and durability. Kinetic also offers a lifetime warranty to ensure that you always have a trainer on hand. What Type of Bicycle Trainer to Choose? 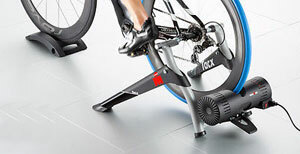 A wind trainer is one of the most accessible options. They’re pretty basic in design, but don’t let that simplicity fool you. These trainers provide an excellent progressive resistance. The back wheel rests on a roller that’s attached to a fan. As you cycle, you spin the fan and take advantage of wind resistance, much like you would on an actual trail. 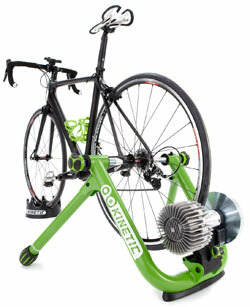 The biggest advantage of wind trainers is that they provide progressive resistance. The harder you pedal, the more resistance you will feel. These trainers are also relatively inexpensive. It’s ideal for new riders as well due to its simplicity. These trainers are considerably louder than other options. There’s also limited features that allow you to change the resistance beyond the speed of pedaling. It’s very easy to max out the level of resistance. Magnetic trainers use a set of magnets to create resistance. It has a flywheel with various magnets that pass near another set of magnets with the same polarity. This results in resistance through repulsion. You can manually adjust the resistance on the trainer itself. Advanced electronic models utilize a remote control to make adjustments. Virtually silent, these trainers won’t disturb others in the home. The fact that they can be adjusted manually is another perk. 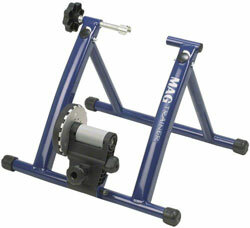 Many cyclists also enjoy magnetic trainers because they can be set to replicate specific riding styles. Unfortunately, magnetic trainers have a reputation for being easy to break. The magnets are prone to dislodging, rendering the unit useless. It also has a relatively low resistance range, making it fairly easy for experienced riders. This type of trainer uses a magnetic flywheel attached to an impeller. It’s in a viscous fluid like silicone to provide resistance. The harder you pedal, the more resistance the fluid provides. It’s a popular option and many manufacturers have created advanced models with a bevy of features to further customize the training session. Fluid trainers are the best for imitating road conditions. Resistance can be adjusted a variety of ways to fine tune the experience. If you have an electronic version, there are even more ways to adjust. It’s also one of the quietest options available. Despite all the good it has, fluid trainers have a reputation of leaking. Prolonged use can cause overheating that results in the fluid leaking out of the chamber and making the trainer useless. Pressure plates are used to provide resistance. Adjusting resistance only requires the addition of more plates, allowing you to make adjustments very easily. The plates press against the roller that’s making contact with the rear wheel, making it tougher to pedal. Centrifugal trainers aren’t as noisy as other options. They’re also very easy to adjust and understand. It’s not a complicated machine to operate, making it great for those new to indoor trainers. Because the plates are making direct contact with the rollers, there’s a high chance of damage. They’re known to deteriorate over time and break if used abrasively. While these trainers may seem simple in design, they’re quite tough to use. They consist of three rollers inside a metal frame. Roller trainers use both wheels, creating a realistic riding experience. There’s also add-on units that take advantage of other types of trainer resistance methods, such as fans and magnets. Rollers challenge your form and make you retain your balance. This could ultimately prove to be beneficial in the long run. It also replicates the feeling of riding on a road very well. These are tough to use. In fact, they’re mostly used by professional riders for training. They’re tough to get used too and require a lot of control. While most trainers are relatively easy to connect, your bike’s specific measurements may not accommodate the unit. For example, not every trainer provides a wide roller that every bike can fit. Not only that, but axel requirement might differ. Some trainers offer direct attachment to the frame. It requires removal of the rear wheel entirely and replacing it with the trainer. It’s a more efficient connection, but not every trainer works with all drivetrains. It’s important to check compatibility and see if the particular manufacturer offers an attachment for your bike’s configurations. This is especially important if you live with other people or share walls and floors with others in an apartment complex. Trainers naturally make noise, but some are quieter than others. It’s also important to consider vibrations. Vibrations can travel through floors and walls. If this is a concern, it’s a good idea to avoid wind trainers and go with a fluid or magnetic option. Chances are, you’re going to be pedaling quite fast on these little machines. It’s imperative that you choose a stable unit that can withstand the constant movement. An inferior trainer that’s poorly designed can give out and cause you to make contact with the floor, resulting in a dangerous crash. Many manufacturers have stability features to help avoid this potential issue. Some trainers have separate attachments that allow you to perform typical side-to-side movements you would perform on a road. These articulating attachments are firm and stable on the ground. However, they let the bike lean and simulate curves and turns on a trail. It’s great for improving balance on the bike and preserving strength in your core when you can’t get out on a real road. It’s a good idea to invest in separate tires for the trainer. Constant friction can wear standard tires out quickly. Regular use will ruin normal tires. Training tires are made for these machines. They are tougher and have more tread that can withstand the constant friction. They won’t wear out as quickly and can help save your good tires for the road. Trainers are pretty basic in design. However, more advanced options are available. They can improve the overall functionality of the trainer and provide you with a slew of new features. One of the most notable is electronically controlled resistance. With this technology, there’s no need to get off the bike to make adjustments. It’s all done remotely. Another feature is smart connectivity. This is useful if you plan on tracking your progress. These trainers connect to a smartphone and use additional sensors to display performance information. It can also adjust resistance automatically based on preset information. With that being said, these features will drive up the cost of the trainer significantly. 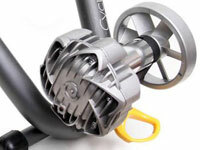 Indoor bike trainers can do wonders for your performance. If you ride competitively, you can train anywhere you want and work on specific aspects of your ride. Alternatively, these simple machines are great for cycling when the weather outside won’t let you. Regardless of your reasoning, choosing a high-quality trainer for your needs will allow you to reach your full cycling potential.